Mary is doing wonderfully. We saw Dr. V (the cardiologist) last Thursday - he was really pleased with her. He said she looked like a real baby. Ha! She had an echo done and everything looked good. At 7 weeks, she's tipping the scale at 10 1/2 pounds. 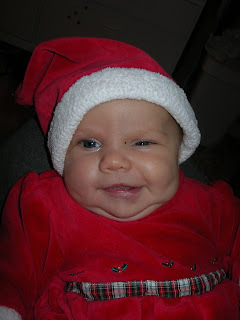 She is smiling and cooing more each day. She's my favorite gift this year. I just got your Christmas card and was thrilled (and surprised) to hear of little Mary!!! She is beautiful, Charlie is your double and Sam's bruised forehead seems to make your trio complete. Jason, Noah, Olivia and I shall keep all of you in our thoughts and prayers, paying special attention of course to baby Mary. Please do not hesitate to call me should you need anything. Maybe we'll see you at Upward??? Your baby is soooooo beautiful!!! we regularly lift you all up in prayer and I am so glad that you have this blogspot so I can regularly check up on the latest news on Mary. I see how God is so good and merciful, as I see how He is healing her. Nothing is too difficult for God!!! Was she breast milk drunk in this shot? Too cute..she is such a happy soul. I love her smiles. We were delighted to receive your photo with the blog address. Thank you! Now we can follow beautiful Mary and your family's journey. Keep us all posted. We love you and are praying for you!